PulseBeat Guitars - 1968 Standel "Custom"
In the late 1960's Standel, based in California, was an amplifier manufacturer who produced several half-hearted attempts to get into the guitar production business. Somehow Standel hooked up with the Harptone company of Newark, New Jersey which was a well-known case manufacturer with some background in guitar production. 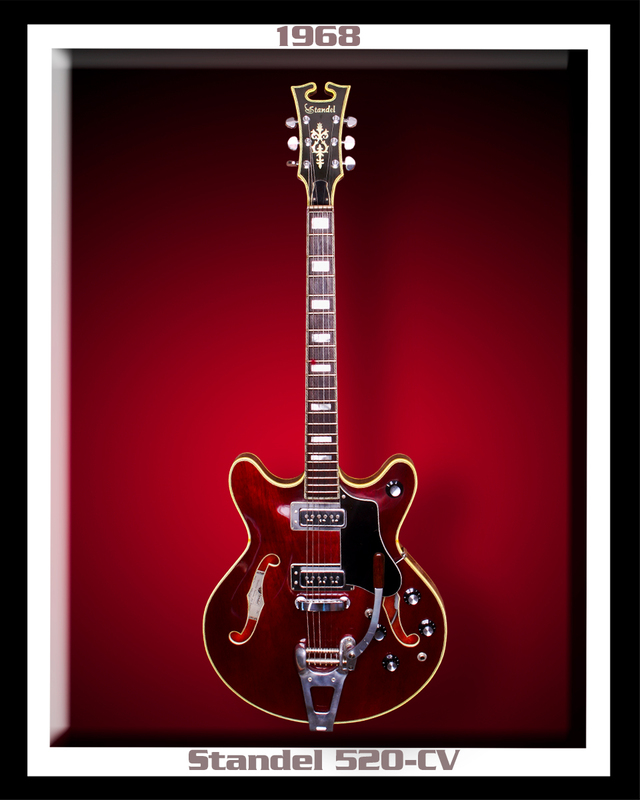 Harptone commissioned legendary New Jersey luthier Sam Koontz, known for his original archtop creations, to design a line of hollowbody instruments and to create the Standel/Harptone production line. 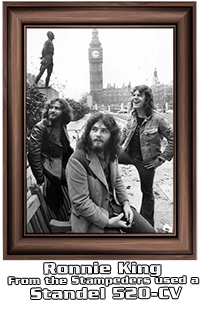 The guitars were offered in a range of models and branded for Standel which were distributed out of California. Soon enough, the Standel company ran into huge financial trouble and these guitars turned into one of the great"lost" instruments of the 1960's era. All Standel/Harptone instruments feature very high-grade workmanship throughout and feature hand-tooled quality hardware. The most distinctive common feature was the unique Koontz-designed headstock with the large center scoop. This Standel 520-CV Deluxe Thinline hollow body guitar has an incredible sound, similarly to a 50's Gretsch "G" 6120 or a 50's Gibson ES-335. This guitar features a sunburst lacquer finish, laminated maple body, and mahogany neck with a rosewood fingerboard. It's a beautifully made and very rare example of "SUPERB" 1960's American Guitar Design. 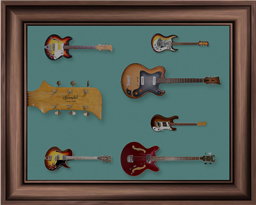 These guitars were introduced in the late 1960's at the point where solid-bodies were making a reappearance. With timing being everything... if these incredible guitars had they been introduced just a few years earlier, they would no doubt, be much better known today. 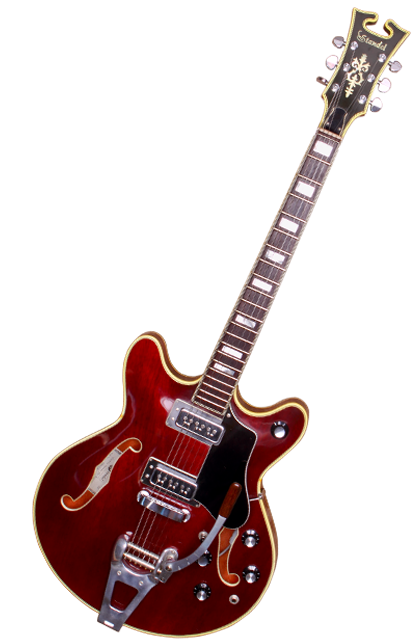 A very fine 1960's American-made instrument at a reasonable price for its time. These instruments are not only incredibly classy looking but are also quite rare... having only about 300 ever made. Today, the Standel "Deluxe" 520-CV has appreciated in value considerably and sells for a very respectable collector price. 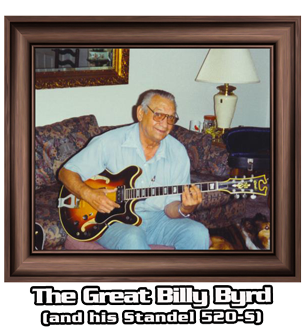 The GREAT Billy Byrd himself played what he described as "his beloved Standell guitar." He also said in many interviews that "of all the instruments I have owned through the years, even more so than the Byrdland which Hank Garland and I co-designed... my Standel Custom is my favorite."